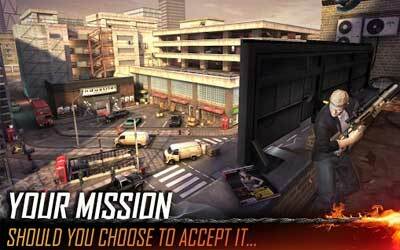 Mission Impossible RogueNation APK 1.0.4 is the adaptation game from Mission Impossible movies. In this game, you will act as IMF agent to hunt Syndicate, the most secretive organization in the world. It seems very simple mission, but you will face many missions that sound impossible. Those jobs are linked in which in the end of mission, you will get the direction of Ethan’s location. You are able to use the weapons in all those missions and you should finish it to continue to the next level. You don’t have to worry since you can select which weapons will be used in each mission. The different of mission will affect on your weapon’s need. Sometimes you have to use sniper rifle and on the other case you will use assault rifle. From every mission you have finished, you will get the amount of money. By having this money, you are able to upgrade your weapons to be more sophisticated. This game is well prepared since the control pads are very friendly to touch screen devices. To aim the weapon, you can utilize the left screen. At the same time, right screen is purposed as shooting buttons. If you are going to make a movement, you just need to tap the screen on the place where you want to move. This game will present you amazing graphic quality, so it will be as real as possible. At the same time, the sound effect is clearly sounded during your mission. You will need 99 megabyte free space on your android to install this shooting game. The more free space will be better to get this game smoother. In addition, you need Android with operating system 3.0 or higher to run this game on your android device. Install Mission Impossible RogueNation for Android right now and tell your friends how heart-pounded it is. Drone UI improvements, it’s now easier to organize & upgrade your drone!